And big surprise: everyone wants to know how much it’s going to cost. The bottom line is, again, the bottom line. Not surprisingly people are most interested in what solar will cost them, and for good reason: popular knowledge about the cost of solar has not caught up with the sharp drop in pricing, let alone the opportunity for new ways to finance solar (leases and loans). A large percentage of respondents here said that they also wanted to know about financing options available. Either these folks have heard about financing options already or haven’t and they want to understand what those options are. 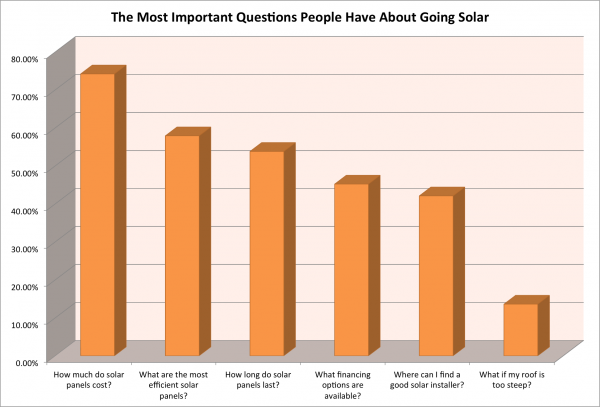 Concerns over how long solar panels last, which are most efficient, and whether or not the homeowner would need a new roof before going solar were some of the most frequently asked questions. People want to know that both the economics work out and that they’re getting a great product. In other words: will installing solar make or save me money? And if I believe the financial analysis, will the equipment and quality be there to make sure I reap all the benefits? No big surprises here: costs vs savings is going to play a critical roll in the buying decision. Homeowners want to get a fair deal in line with the value of going solar, but also make sure they are getting a quality product. We work with solar installation companies with strong reputations because the ability to accurately quote and explain the nuances of each solar installation is crucial to closing sales and ensuring 25-year performance. We, like our installer partners, are driven to see more solar get built. If you have specific questions or thoughts, we’d love to hear from you! p.s. we are hiring! Send a note if you’re driven to help more people go solar.